The TD-1KPX2 offers the same innovative, highly acclaimed folding design of the TD-1KPX V-Drums Portable with an updated kick pad. Roland’s famous mesh-head V-Pads for snare and toms deliver an inspiring drumming experience with natural rebound, feel, and playability, while the kick pad is now perfect for either double—or single—kick pedal setups, thanks to a wider playing surface. 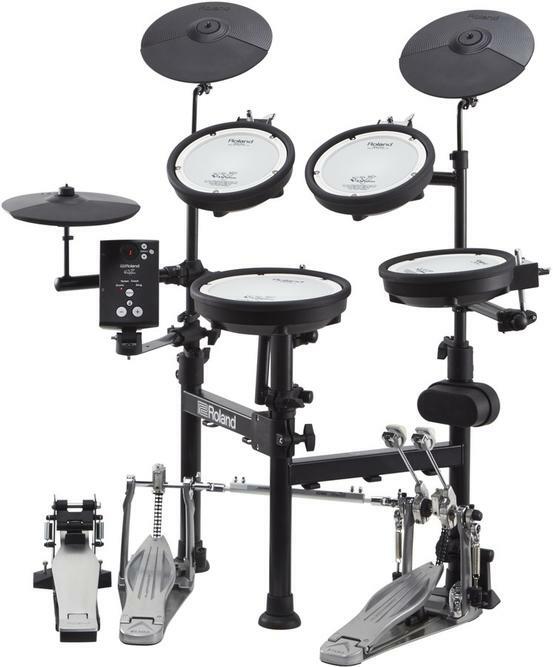 The TD-1KPX2’s unique folding design allows the kit to be packed down in seconds for easy transport and storage without removing the pads and cymbals. And despite its minimal footprint and light weight, the durable stand offers rock-solid stability for any performance style. Setup is fast and simple, letting you play the TD-1KPX2 anywhere—home, live gig, or rehearsal studio. Simply add a twin or single acoustic kick pedal and start drumming! Solid, durable, and easy to set up, the TD-1KPX2’s innovative folding stand adapts to fit any storage space or travel situation. You can partially fold the stand and the pads, slimming the kit into a smaller size that can easily be placed in the corner of your room. Folding the kit completely reduces the size even further, allowing it to fit into the dedicated carrying case* for out-of-the-way storage and streamlined transport. Setting up the TD-1KPX2 is a breeze—all you need is a dedicated drum tuning key and you’re ready to play in seconds. Simply unfold everything, adjust the stand and pad positions, attach an acoustic kick pedal (not included), and start drumming. *CB-TDP Carrying Case sold separately. While the TD-1KPX2’s pads and cymbals are compact, their playability is not compromised in any way. The 8-inch PDX-8 and 6.5-inch PDX-6 mesh-head V-Pads feature Roland’s amazing dual-triggering technology for accurate and even sensing between the head and rim. On the PDX-8 snare pad, the rim area expands the pad diameter to 10 inches, allowing for comfortable and quiet rim shots. CY-5 cymbal pads for cymbals and hi-hat provide 10-inch playing surfaces and swinging movement for natural response and great playing feel. The cymbals have separate bow and edge triggering and support chokes for a true-to-life playing experience, while the hi-hats offer smooth and subtle tonal transitions from open to closed. The big story with the TD-1KPX2 is the ability to play double-kick patterns, thanks to the wider kick pad that accommodates two side-by-side beaters when using a twin acoustic kick pedal setup. Built into the TD-1KPX2 module is a wealth of enjoyable functions to encourage learning, no matter whether you’re teaching yourself to play, studying regularly with an instructor, or simply wanting to keep your skills in shape. Think of this kit as your own live-in drum teacher and personal backing band, packed with tutorial features that develop technique, boost motivation, and help you get the most out of practice time. Play along with the onboard metronome to tighten your timing, and use Coach mode to build and maintain speed, stamina, and accuracy. Get ready for your gigs or band rehearsals by jamming with the internal songs in the sound module, or connect a smartphone or music player via the Mix In jack and drum along with your favorite tunes. And with the handy onboard recording function, you can always get instant feedback on your progress. The TD-1KPX2 is not just fun to play by itself—it’s also a great way to make music with your computer. Included is a built-in USB-MIDI interface, making it simple to communicate with music software via a single USB cable. Maybe you’ll transfer your playing into your computer-based recording software, capturing a live drum feel in your latest masterpiece. Or perhaps you’ll learn rudimentary drumming techniques using the optional DT-1 V-Drums Tutor software. Quiet playability is essential for most drummers when playing and practicing drums at home. The TD-1KPX2 includes low-noise mesh-head pads for snare and toms, and an ultra-quiet FD-9 Hi-Hat Control Pedal. And by swapping your regular single acoustic pedal kick pedal for an optional KT-9 beater-less kick pedal, you’ll avoid the constant beater “thump” that transfers vibration and noise to those around you. This setup is so quiet it can even be used for night practice with headphones! The wide selection of available accessories and options will further enhance your TD-1KPX2 playing experience. The space-saving PM-03 Personal Monitor with 2.1-channel speaker is the perfect companion for amplifying your drums at home. For beginning drummers, the DAP-3X V-Drums Accessory Package provides everything needed to get playing the TD-1KPX2, including a pair of hickory drumsticks, an acoustic kick pedal, and a drum throne. Specially designed for portable V-Drums, the TDM-3 Drum Mat helps reduce vibration through the floor when playing and protects floor surfaces against damage. The CB-TDP Carrying Case is another useful option, providing a convenient way to transport and protect the TD-1KPX2.